This is a big one in all senses. The classic and well known Mjollnir, Thor's Hammer. It was used even before xtian times, although when xtianity came to Northern Europe, was used also as a pendant. 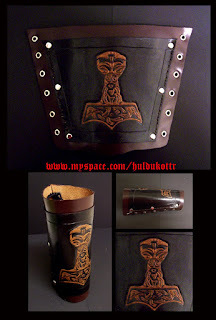 There were many bracers hallowed to the Thunderer in Germania in Scandinavia in heathen times, so this one is our small tribute to the giants old crusher.